What the blurb says: “A hitman must be anonymous, amoral … and alone. Victor is the face in the crowd you don’t see, a perfect assassin with nothing to live for. But when an old friend turns to him for help he finds he can’t refuse. For once his objective isn’t to kill, but to protect. This is the first Victor the Assassin book I’ve read, and it certainly won’t be the last! 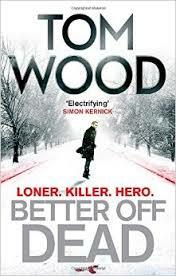 Hooking me in from the every first page, author Tom Wood has crafted a novel with terrific pace, a contemporary, gritty feel and, rather unexpected for a novel whose protagonist is an assassin, a real depth of heart. In this story, Victor is called by an old contact, now enemy – Russian crime boss Norimov – and asked to protect his estranged daughter who is being targeted by an unidentified gang. At first Victor refuses, he owes Norimov nothing, but finally agrees to find and protect Gisele in honour of her dead mother – Eleanor – who was Victor’s friend. In London, Victor realises that finding Gisele may be more problematic than he’d first anticipated. As he researches her last known movements, he encounters a number of challenges from local muscle, and tries to piece together who the threats are coming from. When he locates Gisele things aren’t any clearer. She has no idea who is after her, and is highly reluctant to go with Victor. He manages to persuade her, and that’s when the serious attacks begin. Forced to rely on his instincts and training, Victor battles to keep Gisele safe as they try to unravel the real motive driving those that are targeting her. With some fabulous action sequences, and ever increasing tension, this is a breath-taking read from start to finish. The bond that grows between Gisele and Victor makes them an engaging pair, and although Gisele has no special training aside from a few self-defence classes, she’s a fast learner and a brave co-protagonist. She’s also adept at challenging Victor, acting rather like a moral compass in the more violent moments. This pacey, exciting seat-of-your-pants read, as a must read for all thriller fans.